In Part 2, we examined the reasons why Andretti is actually in good enough racing shape to make an Indy 500 comeback a reality. In this article, we will read Andretti explain how he knew when he had “it,” as well as some of the perks that have come along with the successes that he enjoyed in racing. “There’s no way you can know if you’re really up to the job or not,” Andretti said. “At the beginning, you’re driven by passion, competition, desire, all those elements as you start down that path. For me, once I fell in love with the sport, when I was just a teenager, the mold was cast. Even when speaking in a hypothetical manner, if racing didn’t work out, Andretti saw himself living another life at speed. “I might have pursued a career as a fighter pilot,” he said. As Andretti began driving, though initially and always driven by his passion, there were certain ways in which he knew that he had a special talent. “Once you get involved in it, you measure yourself by results,” he said. “After that, you’re just setting more ambitious goals. You’re always measuring up against the best, and that’s the only way that you can try to get your game up. Throughout his career, which spanned full-time between the late 1960s to the mid-1990s, Andretti earned many race wins and championships, including the 1967 Daytona 500, the 1969 Indianapolis 500, and the 1978 Formula 1 World Championship. His last race win was in 1993 during the Valvoline 200 Indy car race at the ISM Raceway in Phoenix (formerly the Phoenix International Raceway). The victory made him the first driver to win Indy car races in four different decades. Having the success that he did brought some unique opportunities for Andretti. In 1997, an IMAX film, “Super Speedway,” was released that featured Andretti as one of the lead biographical characters. When pressed for a specific example of a time in which he felt star-struck over a celebrity, he mentioned meeting Lady Gaga. 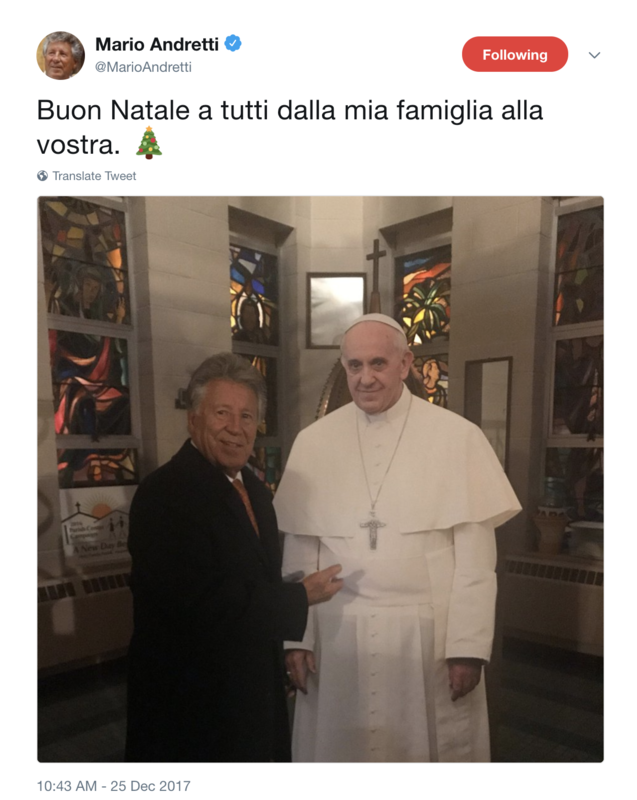 Late in 2017, he had the opportunity to meet Pope Francis. “We have opportunities to meet heads of state,” Andretti said. “We have opportunities to meet other celebrities that you definitely respect and look up to and get star-struck over. Be sure to check out Part 4, where Andretti discusses the most important teammate he ever had and the fear he faced when he retired from racing. Lady Gaga photo courtesy INDYCAR.